I learned a lot about making angel food cake at work this week...because I made THREE of them on Tuesday...the first angel food cakes I've ever made! 1. There's a heck of a lot of egg separating and sifting goin' on. But, apparently, the sifting is essential to get that light-as-air texture. 2. Cream of Tartar really does help egg whites whip up quickly! 3. 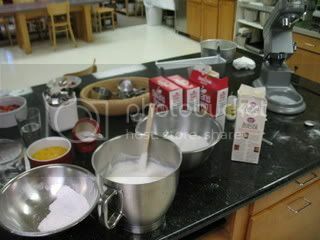 Be sure to gently fold the dry ingredients into the whipped egg whites, but be sure to get it all incorporated before pouring the mixture into the cake pan. You don't want pockets of flour hangin' around. 4. Start with a clean kitchen, because all that separating, sifting, and whipping will dirty many bowls! 5. It's important to turn the baked cakes upside-down to cool...that's why angel food cake pans have legs on them. As the cake cools, it will settle. But since it's cooling upside down, the finished cake will still look risen. 6. Never grease the cake pan or use non-stick. You want it to stick to the sides so that it rises properly. 7. Angel food cake is an irresistable and guilt-free sweet treat...it's really all just egg whites! 8. It is particularly good topped with strawberries, bananas, pecans, and a drizzle of Grand Marnier! 9. After making the third cake, it doesn't seem so difficult! Preheat oven to 375. Lower rack in oven and remove higher racks to allow for rising. Sift 1/2 cup sugar and cake flour into a medium bowl 3 times. Using an electric mixter, beat egg whites and salt until foamy. Gradually add remaining 1 1/4 cups sugar, a few tablespoons at a time. Add vanilla and almond extracts and beat until soft, droopy peaks. Sift sugar/flour mixture over egg whites, 1/4 cup at a time, and gently fold in 10 strokes each addition. Transfer batter to ungreased 10-inch angel food cake pan with removable bottom & legs. Cut through batter, lightly, to remove any air bubbles. Bake until cake is light golden brown and top springs back when touched, about 35-45 minutes. Remove cake from oven & Turn cake pan upside down. Cool cake completely. Using a very thin metal spatula or knife, cut around sides and center tube of pan to loosen cake. Push up cake from bottom of pan. Transfer to plate. Angel food cake is one of my favorite cakes however, it is also one of the reasons why I despise baking. When I want it I find a quick call offering mom a smoked pork shoulder in exchange for a cake usually gets me my fix and my walls stay batter free. Nice tips. I love making angel food cake occasionally, when I get enough whites built up in the freezer.